But i never played GTA, GTA 2 , London and GTA Advance. I started GTA 2, but only walked drove around. Should i give this game a try? I don't think the story and the missions will be that amazing after i played all the ,,advanced'' ones. Give it a try. After all this game is where the series started. Yes. 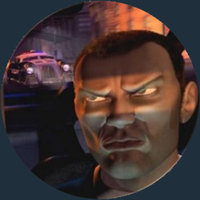 You should complete GTA (and 2) at least once, but I'm only saying that because it was my favourite game back in those days. Ah man the memories... Good times! Don't touch Advance, it's a waste of time. As for GTA2....This game....IT'S ONE OF THE BEST, this game isn't story focused (in fact it's the only GTA without a story), but the amount of fun here is endless, I recommend getting V.11.44 Version, it's free and it fixes all the annoying bugs from the R* Classics version. If you Really don't feel like enjoying Top-Down view games try GTA 2 and GTA Advance First. I, like yourself, have completed all of the GTA games apart from the top down ones. I am an avid fan so last year I brought the collectors edition with 1, 2 and London included together. I played them all for around 5 mins each and didn't look at them again. Recently I started building my collection again and brought the original GTA2 and the limited edition of GTA 1. It got me thinking, so tonight I started playing GTA 1. I must say that I haven't had this much fun since I first completed the 3D era games for the first time. So yes, you definitely should give them a try. My very first played GTA back in childhood days! Dispite the top-down view I learnt steering cars quite quickly, as all of my friends, who played this, were always cursing the driving xD But the best in this game is that the missions are really enjoyable and the game itself had a very nice climate (certainly putting 3 maps separately could affect). I have yet to find a top down game as good as the first 2 GTA games. Just something about them, the aesthetic. Especially the first one. Definitely give them a go. They are all awesome. Be prepared for using a GBA emulator for Advance should you try it. It's rare and costs a lot online. Sure. Give it a try. It would be cool to look back at the old ones, considering that's where the series started. To anyone who wants to see where Grand Theft Auto all began, no one is stopping you. I certainly am not stopping you. That said (all bias aside), I highly recommend GTA 2, though. Well imo every GTA-fan should experience all of the games in the series at least once, even if they think they wont enjoy the game cause they might be surprised. This certainly was the case for me cause back in the day I thought GTA 1 looked absolutely horrible and I couldn't get myself to play it at all, but now that I gave it a chance I found it's actually real fun and challenging game. Pretty much the same could be said for Londons, I'm on 1969 atm and the missions are fun and memorable (especially the one with ICBM that can blow up the whole city). It's a clunky mess that has aged absolutely horribly, imo. If you haven't already, play GTA 2 - It's the perfection of the 2D Grand Theft Auto game; the definitive top-down open-world experience. Totally untouchable. The game of my childhood: sometimes I play, but only on the network with my brother.